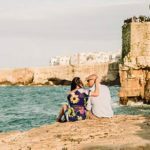 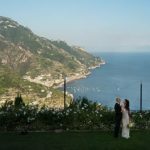 Today I would like to get back to Klarisse and Philippe’s wedding in Amalfi Coast sharing this beautiful idea of a farewell party that they called Bianca party. 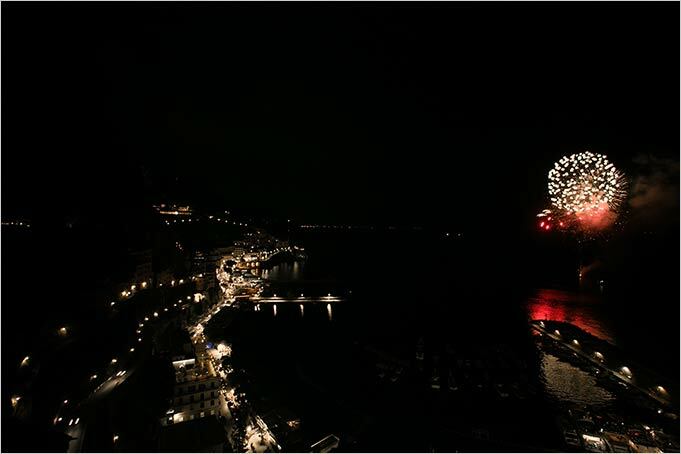 Bianca party came as last of a three days event on Amalfi Coast. 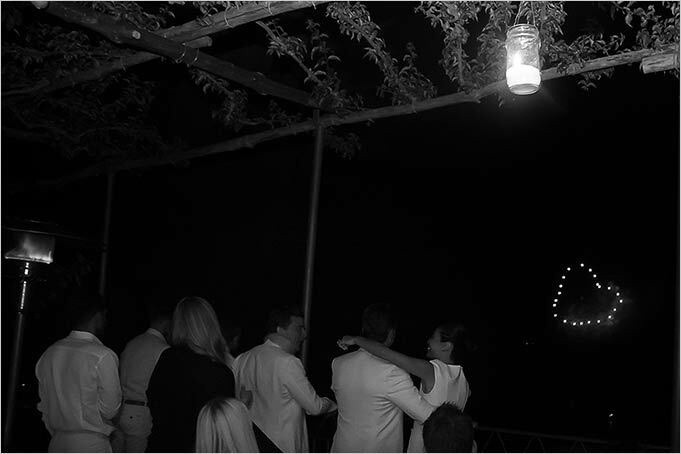 The first event was a traditional Italian style party that I will describe in a following post on our blog, the second day was the wedding day that you can read on our blog and the last one was this elegant event that took place after a day spent in Capri that they reached with private yachts. 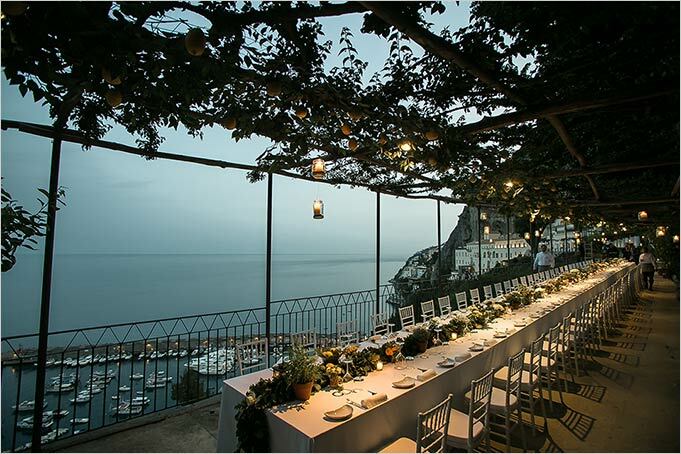 The venue for Bianca Party was Hotel NH Convento in Amalfi. 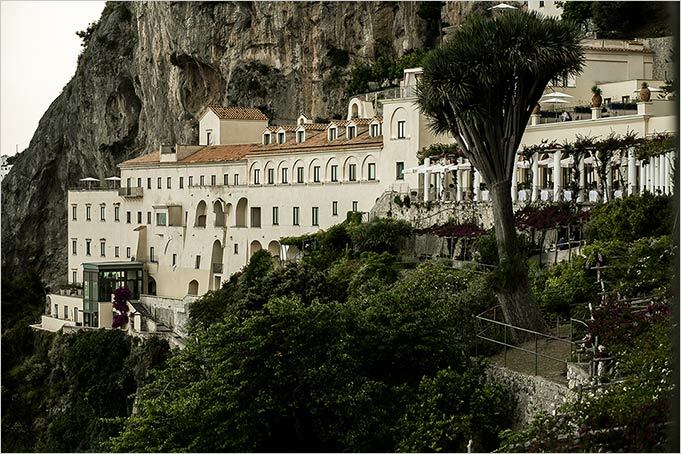 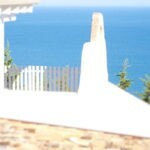 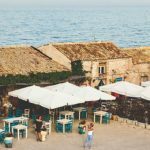 It is a luxury hotel which is located into an historic 13th century monastery perched on a cliff top 80 meters above the sea level. 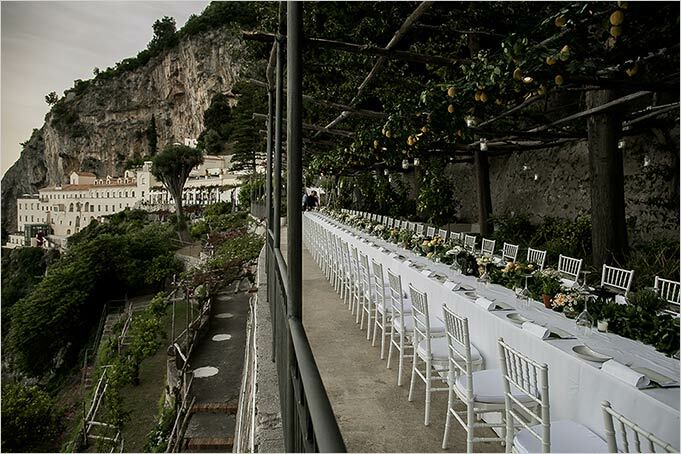 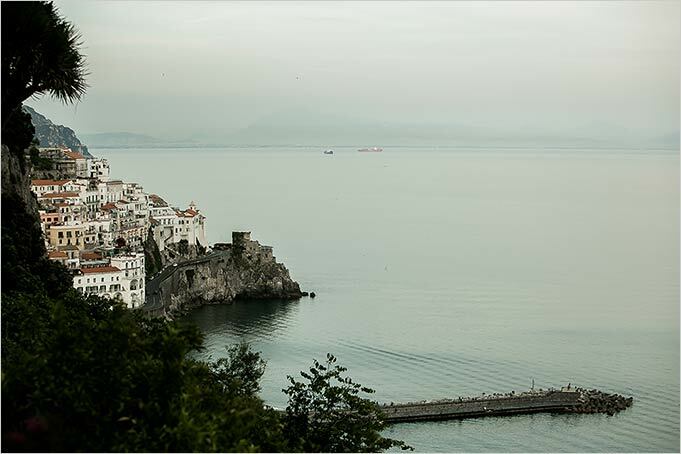 It is nestled in an unique location with stunning views over the amazing Amalfi Coast. 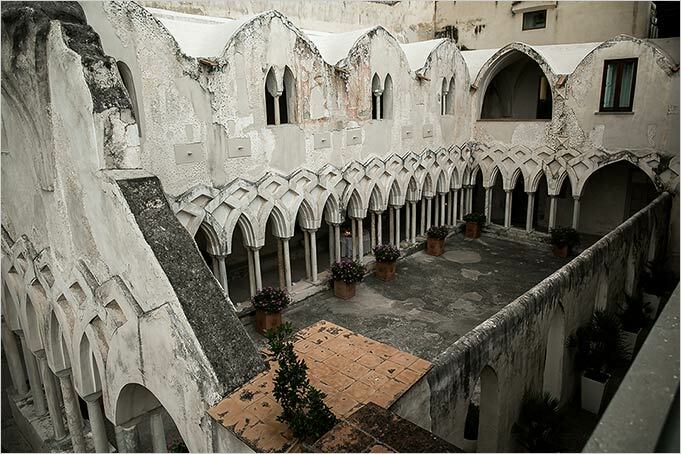 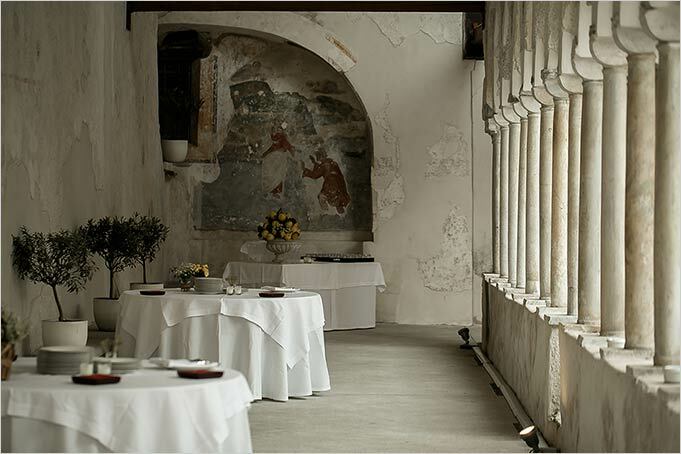 The venue has a fascinating Arab-Norman cloister, and the famous Passeggiata dei Monaci. 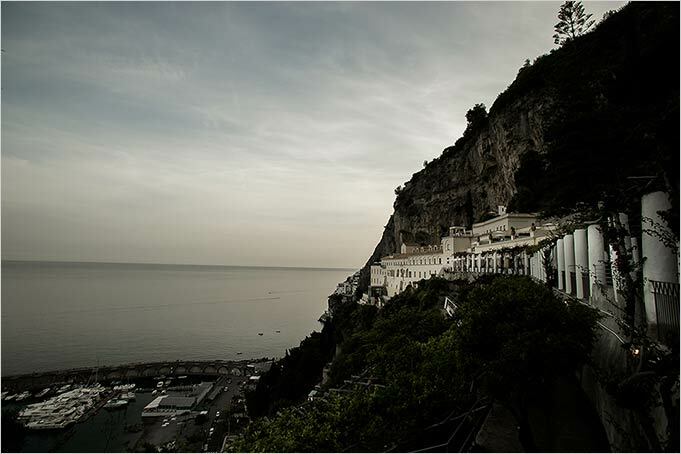 This is the ancient walkway used by monks and nowadays it is a panoramic trail where guests can enjoy Mediterranean garden and a spectacular panorama of Amalfi Coast. 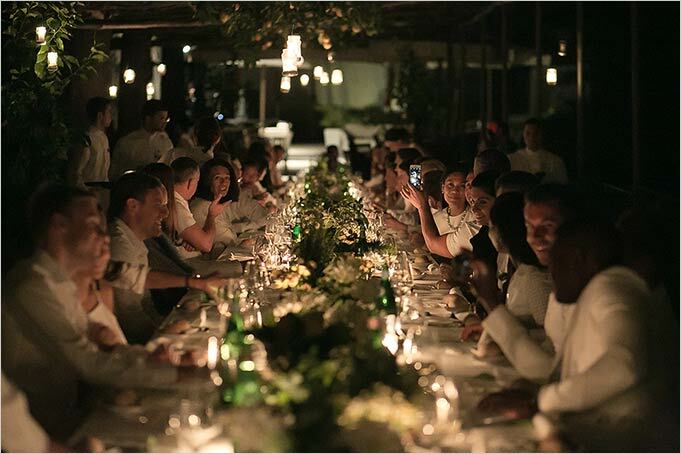 Dress code of the event was elegant but informal total white. 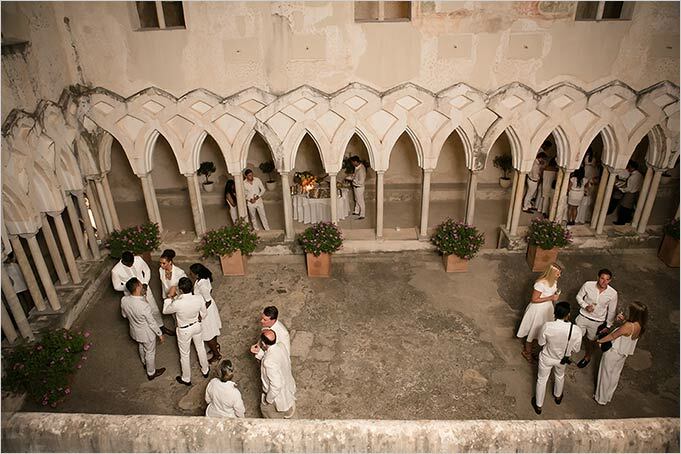 Guests arrived at the hotel with the lift and they reached the beautiful cloister for aperitifs where they started to mingle around tasting delicious canapées and enjoying the beauty of the place and of the landscape with some classical background music. 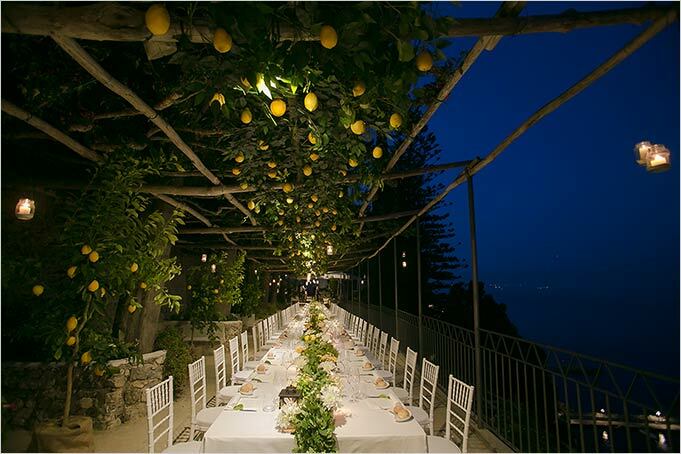 After the welcome aperitif, we invited all guests to Passeggiata dei Monaci, where a long Imperial table was ready to host all guests. 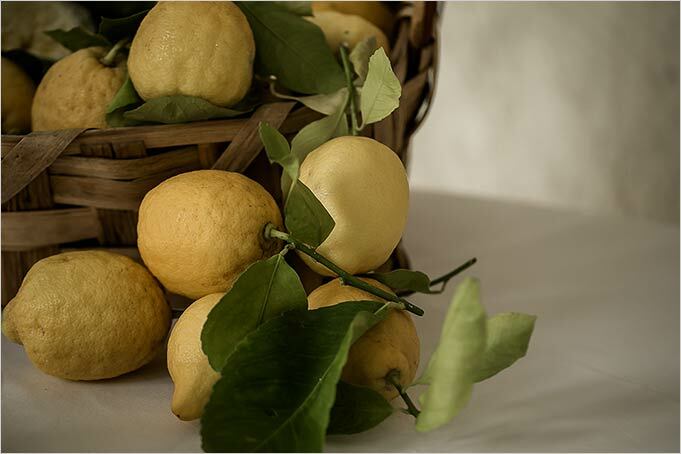 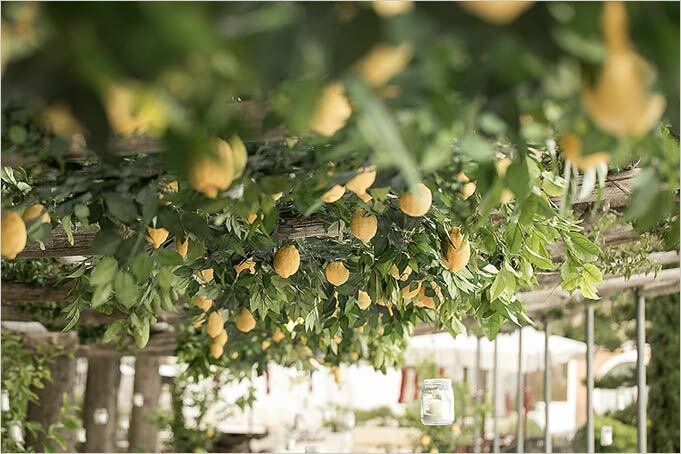 Table was set under a perfect reproduction of a lemon garden with hanging candles and lemons made by the amazing floral designer Armando Malafronte. 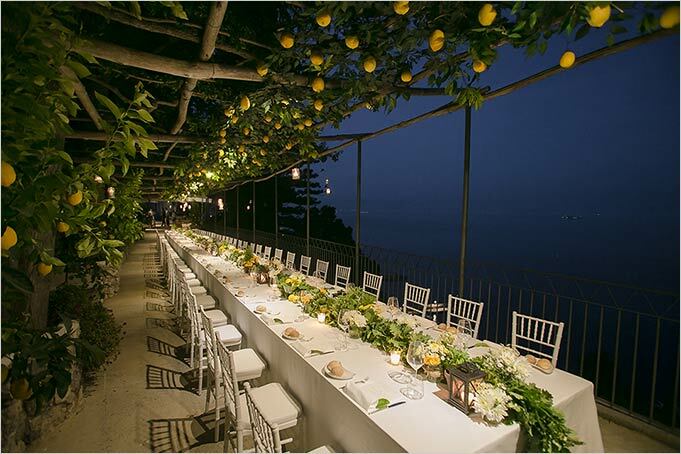 On the table a long decoration with garden flowers in simple vases with lots of candles. 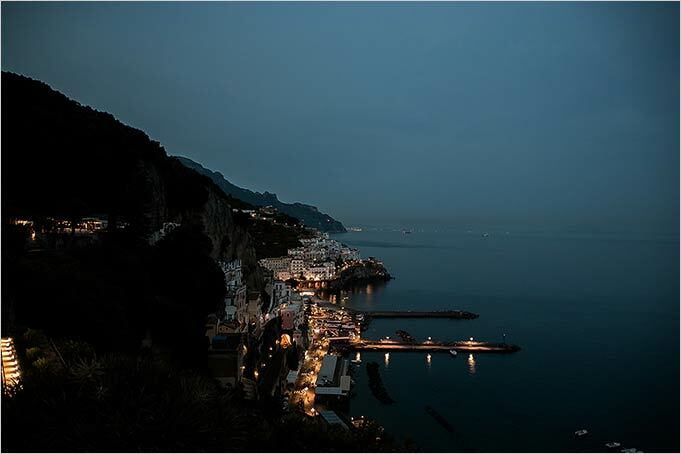 The result was absolutely stunning and the landscape of Amalfi by night made the night really unforgettable for everybody, me and my team included. 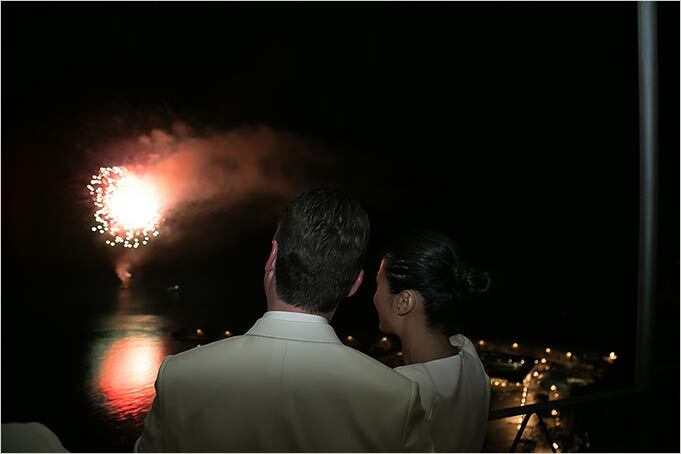 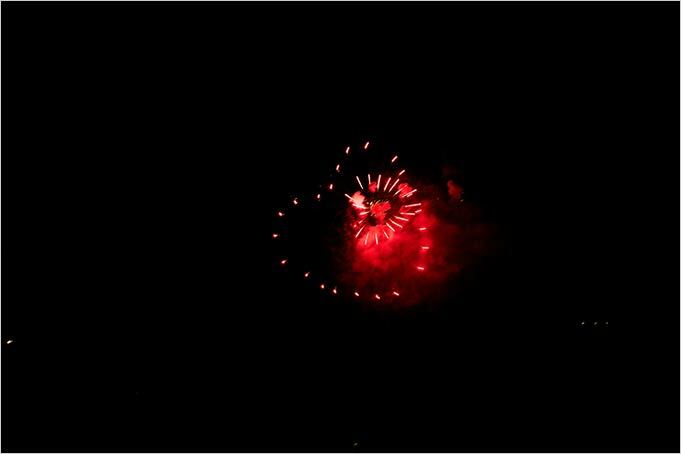 The evening and the three days wedding event ended up with a surprise for the bride, extraordinary fireworks with a huge and romantic red heart, Klarisse was absolutely astonished and visibly touched. 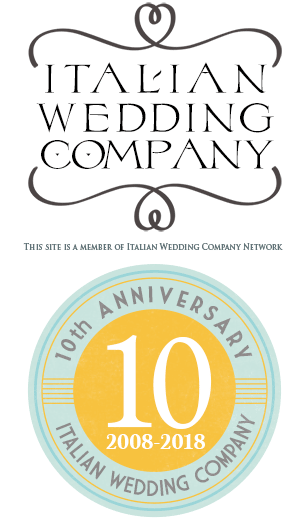 A very special thanks to David Bastianoni studio for the gorgeous photos. 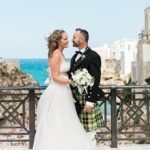 It’s been a hard week of work for all of us but the result was amazing, but the best victory for was to see the joy of the couple during these events which has been the best reward for all of us. 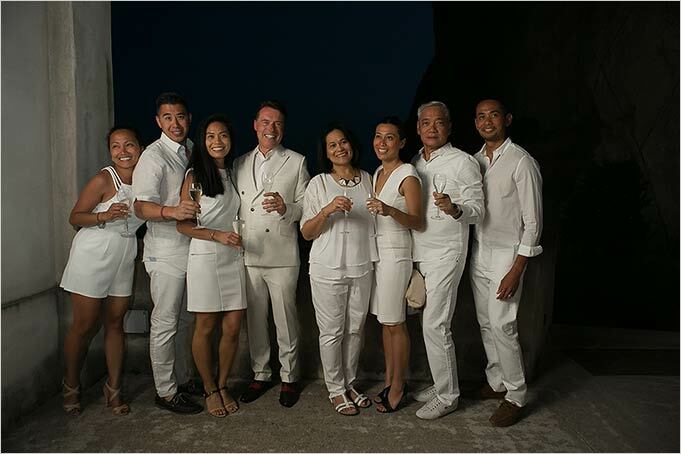 I personally wish to thank Klarisse and Philippe for the opportunity to organise their special week of celebrations, it’s been a great honour for me and my staff.